Amazing Lighting Display so Spectacular its Patented!  Sprink-L-ites™ has created a multi function home & garden landscape lighting system with many creative Indoor Outdoor applications, irrigation, lighting, landscape lighting, as an outdoor humidifier, or water spitters for backyard ponds and water features. With water conservation in mind our energy conservation LED lights are supported by a very efficient drip irrigation system, the (Sprinkle), combined with very low power led lighting, the (Lights). Sprink-L-ites™ look good mounted on a garden trellis, as misters or soothing water spitters around garden ponds. 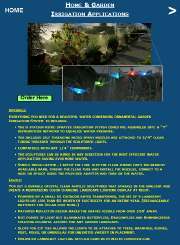 A ¼” water saving sprinkler system or set of 6 string lights, illuminated garden ornaments with misting nozzles and LED pool lights. Transformer powered always on rain or shine. Each light uses less than $0.75 for an entire year, cheaper than batteries and no polluting heavy metals to discard into landfill. A very simple drip irrigation system supported by acrylic lighting fixtures for beautiful outside lighting, or misting system with, LED pond lights for colorful accents. Sprink-L-ites™ water sprinklers, lights, garden decorations, patio misters, pond lights and led accent lighting all in one amazing product. Exclusive on line and some specialty stores. The above Links have details with pictures and additional information for primary Applications using the Award Winning patented Sprink-L-ites™. Irrigation was the primary design function in order to solve a problem watering the potted plants and garden along the front walkway. The final product created such a beautiful lighting effect that other applications became apparent. 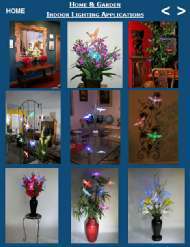 Indoor Home Lighting Uses evolved and creating very innovative and colorful lighting applications. Wall lighting is a very different application, colorful lights arranged as a butterfly release compliment the mantle or a room divider. A pair of Dragonflies chasing each other around an arrangement of cattails makes for a very distinctive Table Lamp and lend themselves to a myriad of future lighting displays for wall sconces, accent lighting and ornamental lighting for commercial applications in Hotels, Restaurants, Lobbies and numerous venues catering to weddings or social gatherings. Garden Lighting and Outdoor Lighting applications were obvious, the sculptures do not need the water connected to be a beautiful functional landscape lighting element. 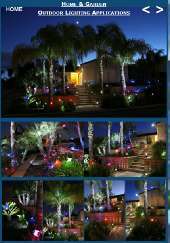 The lights look great highlighting a bush or cluster of flowers and create a dynamic tropical effect when used around Pygmy Date Palms and even stand out against the up lighted trunks. 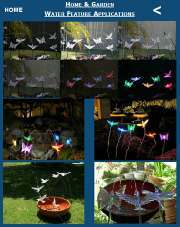 I have designed an arbor for the butterflies clustering around metal roses looking like a butterfly release or hummingbirds collecting nectar and mesmerizing people captivated by the soothing random color changing display. Misters were added replacing the spray nozzles adding yet another function to this marvelous creation. Can you imagine walking along the sidewalk in the night time desert heat looking up into the color changing mist overhead. Just wait till our lights make their appearance in Palm Springs, Phoenix and Las Vegas fascinating people with their functionality and beautiful color changing display. 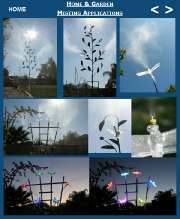 Color changing misters for the patio or functional misters for watering the garden. Water Spitters around water features make a very beautiful application to pool lighting pond lighting or sparkling in a waterfall. The small water stream attracts birds and Hummingbirds are amazing to watch as they try to perch on the delicate water flow and wash their face while perched on the wings of the Dragonfly and Butterfly or beak of the Hummingbird sculpture. 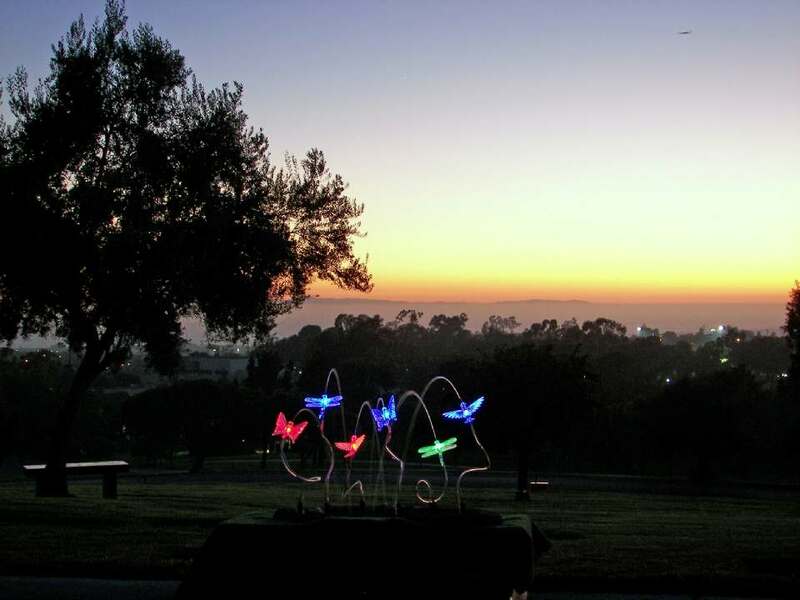 The hummingbirds can play in the water for up to 2 minutes and if the lights are on they curiously will inspect each light as the red light glows putting on a very entertaining show.